Benefiting from a 75 year history in the business of communication, Motorola welcomes you to the future of two-way radio with the Commercial Series. Comprising new portable radios for work-teams that need to keep in touch wherever they are, the family also includes four mobile radios for powerful in-vehicle or fixed site communications. Using the CP040 is second nature thanks to the tough and textured buttons, chunky rotary channel, volume knobs and tricolour status LED, In addition, two program-mable buttons can be set to give immediate access to the four most often-used features, making communication even simpler. With four communication channels, you can use the CP040 to liaise with the whole team or change channel to discuss a more complicated issue one-to-one. The CP040 has a high/low power setting that allows users to extend battery life for up to 19 hours* from a single battery charge. This can be done by switching to low power when the user is in close proximity to other users, as the range is reduced and less power is required. Avoid missed messages with the built-in'scan' function that searches all four channels for activity. Designed and built to the gruelling American standard MIL spec 81 OF and exceeding the exacting 1P54 standard for environmental protection, the CP040 has also passed the Motorola Accelerated Life Test which replicates five years of hard use in the field. Benefiting from Motoroias market-leading experience in designing and manufac-turing two-way radio, the CP040 provides excellent audio quality thanks to Motoroia's voice-compression technology, X-Pand'. 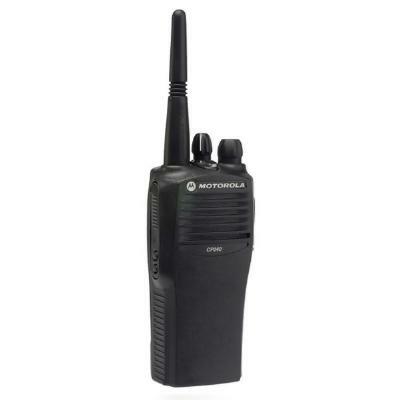 As you would expect from Motorola, the CP040 is supported by a wide range of energy, audio and carry accessories, changing the CP040 into a customised solution. *Based on 5..5.90 (transmit receive:standby) duty cycle, with low power setting and high capacity lithium ion battery in normal operating conditions. Spare batteries and earpieces still available for this radio in stock. Also available for the CP040 is a nylon carrycase with beltclip and optional 3 point waist harness.